If you’ve been following the blog, you’ve already met three members of the PatientsLikeMe Team of Advisors – Dana who is living with bipolar II, Lisa who is living with Parkinson’s and Becky who is living with epilepsy. 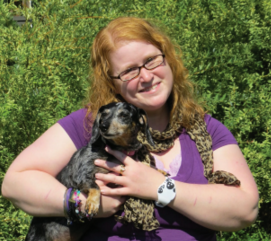 Now, we’d like to introduce Emilie, a social worker and therapist who is living with Sjogren’s Syndrome and fibromyalgia. Emilie is a Licensed Clinical Social Worker (LCSW) who works with children living with chronic illnesses and their families. She’s also been a therapist for both children and adults with chronic illness and in her work has developed a pediatric diabetes pain management program. Emilie herself has an autoimmune disease, fibromyalgia — and recently had to resign from this work that she loves due to the pain, fatigue, and subsequent emotional strain. She hopes to return to doing similar work once her medical issues are more manageable. Emilie believes the question should be asked, “what are the ways your health care provider(s) could be more helpful to you?” to better our understanding of patient centeredness. She believes that doctors need to listen to and respect that their patients know their bodies best. It was really special to be chosen, I didn’t ever in a million years think I would be chosen. When I got to the interview part I thought there’s no way they’ll pick me. When I found out I was chosen I was really excited because I felt like I had been to enough doctors in my life that I had something to share. I hoped that we could help researchers study the things that would be relevant to us — the collective us — instead of just the things they wanted to know and they wanted to study. Being part of the Team of Advisors makes me feel like I’m more in control, like an expert about my own body. When you go to the doctor, they think they know exactly what’s happening — they’re going to treat it they way they treat everyone else with fibromyalgia or Sjogren’s or arthritis. It’s great to be able to have input to help doctors understand that we need to be treated as individuals and not like a disease name. Just because I have migraines, does not mean my migraines are the same as someone who just walked out of the exam room with migraines. Others members on the site have contacted me because I’m on the Team of Advisors, and they’ve seen my picture or seen my name and have said “I’ve seen what you’re all doing, and I went to your page and I see you have some of the same things I do and I found you and I thought you could be a good resource for me.” So sometimes I’ve been able to help out and that has been nice. One of the things tracking my health on PatientsLikeMe has helped me recognize is that sometimes I think I’ve been feeling lousy forever — I think that’s easy for people with chronic pain to do — but when I look back at my InstantMe chart, I realize there are more days than I thought where I felt good. It gives me hope that things aren’t bad all of the time and that things can get better. When I go to my doctor and they ask me how things have been, I can tell them that things have been up and down, and sometimes there have been more good days than bad days. Share this post on Twitter and help spread the word for autoimmune diseases and fibromyalgia. I am still dealing with two doctors fighting over what my condition is. I have an Neuro-Optomolgist who rescued me and healed me during my flair up in 2013 (I have not had one since) that says I have NMO or known as Device’s Disease or Neuromylitis Optical. Then I have a Neurologist that I found and I really like and really listen to me, and did more test than any doctor I had seen. He says I have Fibromyalgia and Silent Migraine Syndrome which definitely makes more sense to me than the NMO after dong research. However, I am torn between the two doctors. One wants me to stay on Cellcept an immune suppressment and the other one want me to get off of the Celllcept saying it is hurting me in the long run and I do not need to be on it, but the doctors are not communicating as much as I have tried. You said you have been to a bunch of doctors, do you have any suggestions?